Jewelers have a hard life when it comes to photography. 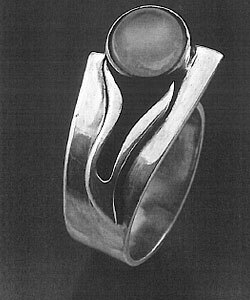 Despite the quality of their subjects, most jewelry images seem flat and dull. Yet, it is surprisingly easy to make eye-popping photographs of small objects like jewelry. These are images that go beyond the usual "pictures of things just lying around." Many jewelers have asked me how to add some sizzle to their pictures. Years ago, I had given a lot of thought to improving my jewelry photos and came up with a simple tabletop setup that makes it a snap to give your close-up studio shots a touch of the old "bling-bling." Earlier, in the pages of The Crafts Report, I described how to setup a tabletop studio. What I am proposing now is a variation on that basic setup. Some regular readers may find some duplication here, but I am starting with the basics so that everyone is up to speed on creating this setup. The first thing you will need is two matched lights, but unlike "normal size" object photography, I recommend that you use lights that are either daylight CFLs or a pair of the new LED arrays. These multi-diode devices provide a lot of light from a small, inexpensive package. They do not generate heat, which makes them perfect for close-up jewelry work. They are available through any one of a number of eBay sellers and at larger camera outlets. 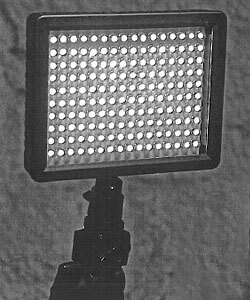 Note: For me, it is dangerous and mad to use traditional tungsten floodlights or quartz-tungsten in close-up work. These lights produce enough heat to melt jewelry and burn hands. I know, as I have the scars to prove it. CFLs and LEDs produce hardly any heat at all and are a much safer alternative when working at the small distances. Too often photographers get so caught up in their tiny subjects that they forget about the backgrounds. Small objects require a place to live other than empty white or black space. For the basic tabletop studio, I suggested that you get some sort of graduated background material; this works very well for closeup photography, too, especially with jewelry. Unfortunately, there are very few small graduated backgrounds for close-up photos. The smallest one I've found is the 22-by-15-inch, graduated backgrounds made by Varitone. However, my floating technique makes even this relatively large piece more usable. 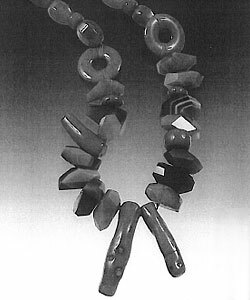 This necklace by Beth Heitner was laid out on the glass with a curve in the chain. This serves two purposes. It is a more interesting shape than laying it out straight or as a round shape; secondly, reducing the height of the necklace in the frame allows you to get closer to the important elements of the piece. Blu-Tack assisted this ring in standing. However, rings are so small it is very hard to see too much of the background or its graduated grays. The trick to "floating" is to create the illusion that that the jewelry is suspended in mid-air. 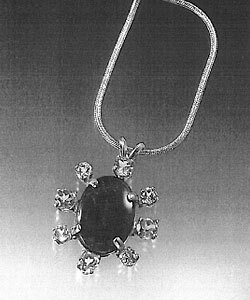 This is done by making a "floating" rig for the jewelry using an ordinary 14-by-17-inch (or larger) piece of anti-glare (non-reflective) glass--the kind that can be gotten at most hardware stores or frame shops. Start by laying down the graduated background flat on a tabletop. Then make two stacks of books on either side of the background about 12 to 14 inches apart and stacked to 12 to 14 inches. 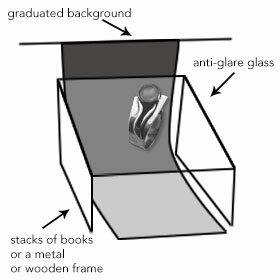 Next, make the rear sides of the stacks a little higher by using something as a wedge, giving the stack and, thus the glass, a slight tilt forward. Lay the glass on the stacks, frosted side down. The books will be the support for the glass although after I figured out this arrangement, I built myself a wire frame out of some shelving baskets I found at the hardware store to support the glass. If you have a workshop and are handy at building things, you could make yourself a simple wooden or metal frame to do the job. I tilt the glass when working close-up because shooting straight down on your subjects will cause your own reflection to appear in the picture. Tilting the glass helps avoid the problem. This shot shows how small objects are laid out on a piece of glass suspended over the background. A metal frame and large clips were used to hold the glass in place. 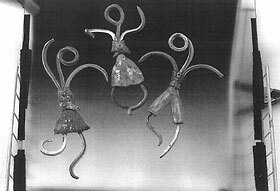 Clay stick figures by Shari Kauffman. Now place your jewelry on the glass, put the camera on a tripod, and frame the subject. Position the subject in such a way over the background that you can see its transition of tones with dark areas on top and light areas below the jewelry. Move the background or the object as necessary until it appears to sit just above the area of lighter tones. If you see reflections of your camera or lights in the glass, eliminate them by repositioning the camera and/or the lights. With jewelry and other small-object photography, it comes in handy to have some pliable adhesive like Blu-Tack® around. It's great for holding things up, such as when you want to stand a bracelet or a ring on end. It also helps to keep all sorts of items from simply sliding off the angled glass. These Multi-diode devices provide alot of light from a small, inexpensive package. Don't underestimate the importance of shooting jewelry on a gratuated background to help create the "floating" illusion. The final trick is lighting the subject. In general, hard surfaces, like polished silver, gold, glass, and so forth, call for soft diffuse light sources. This reduces those horrendous glare spots. CFL and LED arrays are somewhat diffuse or soft lights and are good lighting sources for this sort of photography; they can always be softened further by simply covering them with a diffusing filter or soft white translucent cloth. But do not worry about eliminating all the shine since you actually need a little to give some sparkle to metals and gems. Alternatively, if you are knowledgeable about Photoshop, you can use the "highlight/shadow" tool to soften the glare as well. As always, there is never a one-size-fits-all solution to anything in photography. Every subject is different and demands a unique approach, so expect that you will have to experiment with lighting and the positioning of objects. However, learning how to seemingly suspend objects in midair is worth the effort.